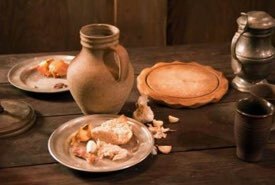 Renaissance leach recipes were very popular in the 1600s. Don't worry, I'm referring to "leaches" the jelly-like sweetmeat, NOT the wriggling "leeches" that swim — BIG difference! Leach was a common medieval confection consisting of a thick, jelly-like preserve set hard enough to slice for serving. Leaches were often shaped or molded into fancy, traditional shapes such as hearts, diamonds, cubs, spades, or crescent moons. This made them very decorative when displayed on a fine, silver tray at banquets. The chewy sweetmeat was often made using almonds and various natural fruit flavorings. 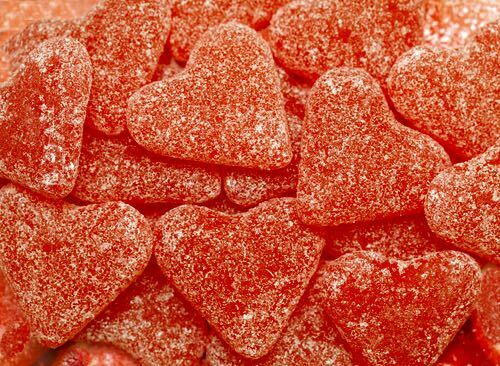 Some leaches were like fruit leathers, and some might have been similar to today's popular gummy worm candies in chewiness and texture. 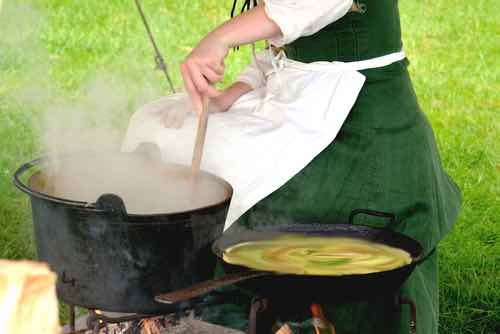 These Renaissance leach recipes are fun to try. It's said that Queen Elizabeth I was very fond of nibbling on leaches, especially if they were very sweet and chewy. If you enjoy eating today's fruit leathers, you'll love them too. Take one Ounce of Iſinglaſs and lay it in Water four and twenty hours, changing Water three or four times, then take a quart of new Milk, boiled with a little ſliced Ginger and a ſtick of Cinamon, one ſpoonful of Roſewater, and a quarter of a Pound of Sugar, when it hath boiled a while, put in the Iſinglaſs, and boil it till it be thick, keeping it always ſtirring, then ſtrain it, and keep it ſtirring, and when it is cold, you may ſlice it out, and ſerve it upon Plates, you may colour it with Saffron, and ſome with Turnſole, and lay the White and that one upon another, and cut it, and it will look like Bacon; it is good for weak people, and Children that have the Rickets. Take ſweet Almonds blanched and beaten with Roſewater, then ſtrained with fair water, wherein hath been boiled Aniſeeds and Ginger, put to it as much cream, wherein pure Iſinglaſs hath been boiled, as will make it ſtiff, and as much Sugar as you pleaſe; let it be ſcalding hot, then run it through a ſtrainer, and when it is cold, ſlice it out, it is very good for a weak body. Red by putting Tornſel into it, or Cochineal; Yellow by putting Saffron in it. Take your Spices beaten and ſearced, and mix them with your ſearced Sugar, mould them up with Gum Arabick infuſed in Roſewater, and ſo print them and dry them. Take your Dates ſtoned and peeled very clean within, beat them fine with Sugar, Ginger, and Cinamon, and a little Roſewater till it will work like Paſte, then print them and keep them dry.